We will soon celebrate Duanwu, or the Dragon Boat Festival, and Pauline D. Loh suggests some sweet dumplings for the occasion. The lunar calendar is filled with festive days marked by food and heroes. We will soon celebrate Duanwu, or the Dragon Boat Festival, and Pauline D. Loh suggests some sweet dumplings for the occasion. The rafters sprouted dangling bunches of dumplings like some strange exotic fruits and we would tread carefully underneath, avoiding the occasional drop of water sliding off the bamboo leaves. My grandmother's kitchen would be redolent with a bouquet of drool-inducing aroma -- the slightly earthy smell of steamed bamboo, the salty spiciness of soy-braised pork, the musky sweetness of red bean paste and heady floral scent of steamed lotus seeds. This would be a week before Duanwu, the Dragon Boat Festival, on the fifth day of the fifth lunar month. And as always, Granny would be telling the youngest grandchild all about Qu Yuan, the patriot poet of the Warring States Period (475-221 BC) who jumped into the river because he was so disappointed with the corruption in court. It is to his memory that we are eating all these bamboo-wrapped dumplings. Originally, the people simply threw rice and other offerings into the river after his death but folklore says he appeared in a dream to a villager and said a delinquent dragon in the river was eating up his offerings, so they needed to wrap it up in bamboo to deter the creature. Like all festivals of pedigree in China, Duanwu is celebrated with a lot of color, noise and food. The color and noise comes from boat races on the river in long, low-slung canoes decorated with a dragon head. There is usually a lot of cheering and drum-beating to urge the favorite teams to the finishing line. After expanding all that energy, the crowds would feast on rice dumplings, and depending on which end of the country you are in, they would be sweet or savory. Until I arrived in Beijing about seven years ago, I only tasted savory dumplings. Our southern rice dumplings were fat, perfect pyramids stuffed with chestnuts, a single salted egg yolk, lots of fat, soy sauce-seasoned pork, dried shrimps and an intensely fragrant dried mushroom. After all these years, I have gotten used to the northern dumplings that use a lot of beans, cereals, lotus nuts, dates and sweetened bean pastes as filling. There is something to be said for the meatless sweet dumplings. My husband particularly enjoys dumplings made with red beans, the fragrant maroon seeds that are also known as adzuki beans. I add some pre-soaked lotus nuts to the dumplings and when they are cooked, they are beautifully fragrant, and it's all natural. In our Yunnan home, we often buy a tea that's called nuomi xiang -- named after the fragrance of glutinous rice. That just about sums up what good glutinous rice should be, really aromatic and wonderfully sticky, of course. 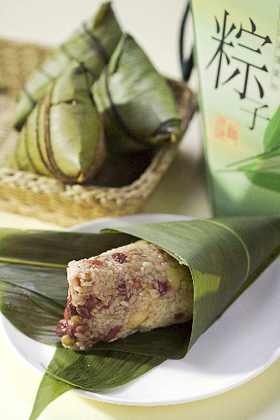 Here are my recipes for simple sweet and savory dumpling that you can make at home easily. Don't worry if you cannot get a perfect cone for your dumplings, what matters is what's inside. And there's nothing to stop you packing it into a bowl and steaming it to make a lovely rice pudding either.